“In the short term, we’re looking at trees that have been burned down or fallen down, barren soils that are just primed for erosion when winter comes,” said Eric Wesselman of the Tuolumne River Trust. A team of federal scientists with Burned Area Emergency Response (BAER) is currently surveying the burned zones to identify the worst erosion danger. Wesselman says on average, funding for BAER programs is about five percent of the overall fire cost. The Rim Fire recently topped $100 million. “This is going to be tens of millions of dollars that we’re going to need for the recovery in the months and years ahead,” Wesselman said. 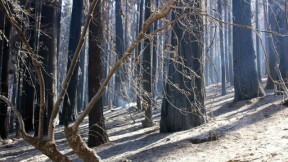 The Tuolumne River Trust is calling on California's senators to help fund recovery of the charred forest, including stabilizing burned areas, planting vegetation and repairing trails and campgrounds.